Have you ever tried to display images in Warcraft, but, failed miserably? Follow these easy steps and learn how to display an image of your liking in any Wacraft map! I'll be using Photo Shop 7 and Wc3 Image Extractor II. 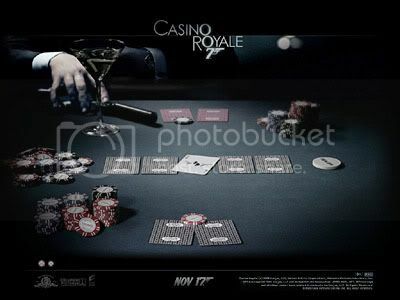 Choose a image of your liking - I have chosen this nice James Bond one. - crop, scale the image to a power of 2, (e.g) 512x512 px, 256x512 px etc. - make a new canvas already being a size of power of 2 and copy&paste your image there. I'll resort to the latter option - I will create a 512x512 px canvas and copy&paste my 300x400 px image there. After that's done, make a selection around the image and open channels. Add an alpha channel and erase the selected part. That should leave you a pink/red like space around the image. Or, if you used the first method and scaled your image to right proportions, you should see no red parts. Save the image in 32-bit TGA. Open the image in a TGA to BLP converter program, Wc3 Image Extractor II, in my case, and convert into .blp. You have finished preparing the image. Proceed to step 2. Right, you got your image ready. It's time to display it. Open World Editor, and, Import Manager (F12 or "Modulo->Import Manager") and import the previously prepared image to your map. Now comes the important part, so pay close attention. So, copy paste these 2 scripts into your maps header and use a custom script/JASS to display the images. - the image must be a power of 2 sized. - the image must have an alpha layer. - Use the "CreateImageEx" function to display the image. Got some of my inspiration from this thread, credits.